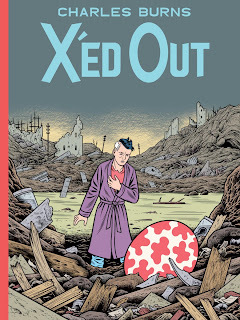 The Newest Rant: Strange Stuff--X'ed Out Volume 1 by Charles Burns. 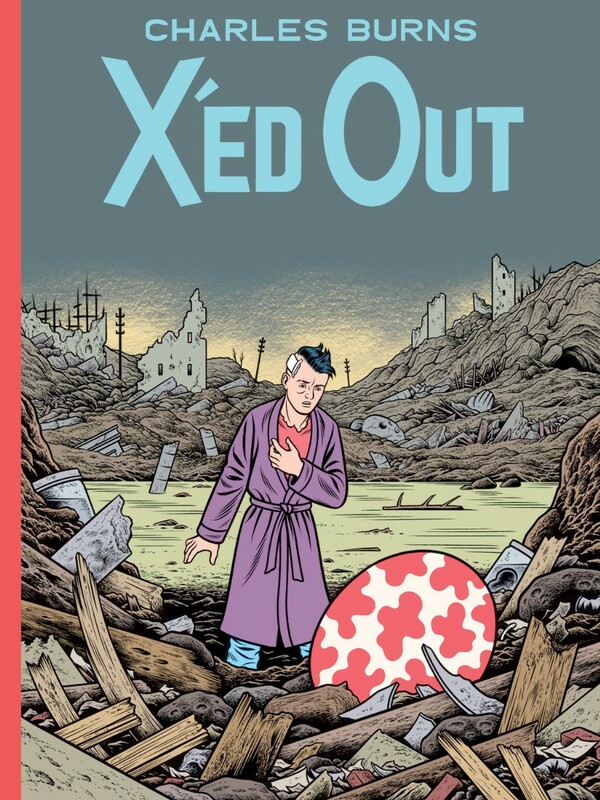 Strange Stuff--X'ed Out Volume 1 by Charles Burns. Bizarre, that is the best way to describe this story. It arguably is about a man named Doug trying to get past his regrets in life by taking drugs that whisk him away to a dreamworld where things are slightly familiar to his strongest memories from real-life, but also oh-so-strange. The story moves between this dreamworld, present-time in real life, the past in real life, and back to the dream-scape all within these 56 pages or so. Burns story is both at once fantastical and full of magic, a reflection on the doldrums of everyday life, and also a horror story in some of its more disturbing images, from the inhuman monsters Doug's dreams, to the fragile people he meets in his waking life. 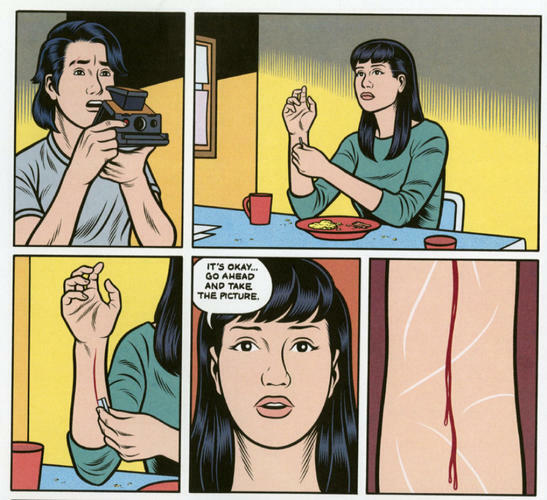 Most eerie moments take place in Doug's dreams, but the most disturbing scenes are all too real moments of his life. ﻿﻿﻿﻿ From memories of a father so defeated by the world he retreats to a basement all day, to a a girl from the photography class with some dark personality elements, Doug's waking life is no picnic, making it all the more interesting how these real-life elements seep into his dreamworld. 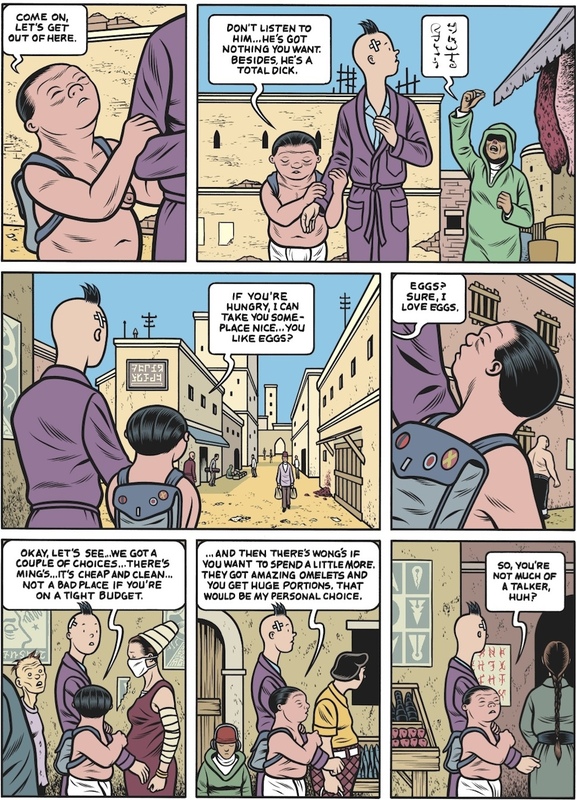 Burn's art does a great job distinguishing the real from the fantasy, with Doug's dreams seeming cartoonish and the real world having Burns more realistic style of drawing his characters and the environment. Burn's skill is augmented by what I believe is his first use of full-color in his work, which helps make the fantasy scenes seem all the more unique and beautiful in contrast to the somewhat more darkly colored real-world. Doug's dreamworld is populated by a wide-cast of exotic characters. I'm told this story draws from a wide variety of sources, from old EC horror comics to famous Tintin ones. 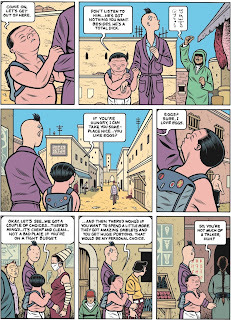 I can see the Tintin aesthetic in the dream scenes for sure, and as I've stated, the comic definetely has some scary scenes--even if they weren't "jump out of your seat" scary and more psychological. Wherever Burns gets his inspiration from, it doesn't dilute the unique story he portrays through X'ed Out. I got this at a big discount at one of my shutting-down Borders because I had been hesitant to pay full price for such a short hardcover book, but after enjoying this entry I think I'd be prepared to pay to continue the story whenever the next installment comes out. X'ed Out for a pretty good price on Amazon. Why not buy it from there or your local comic store?